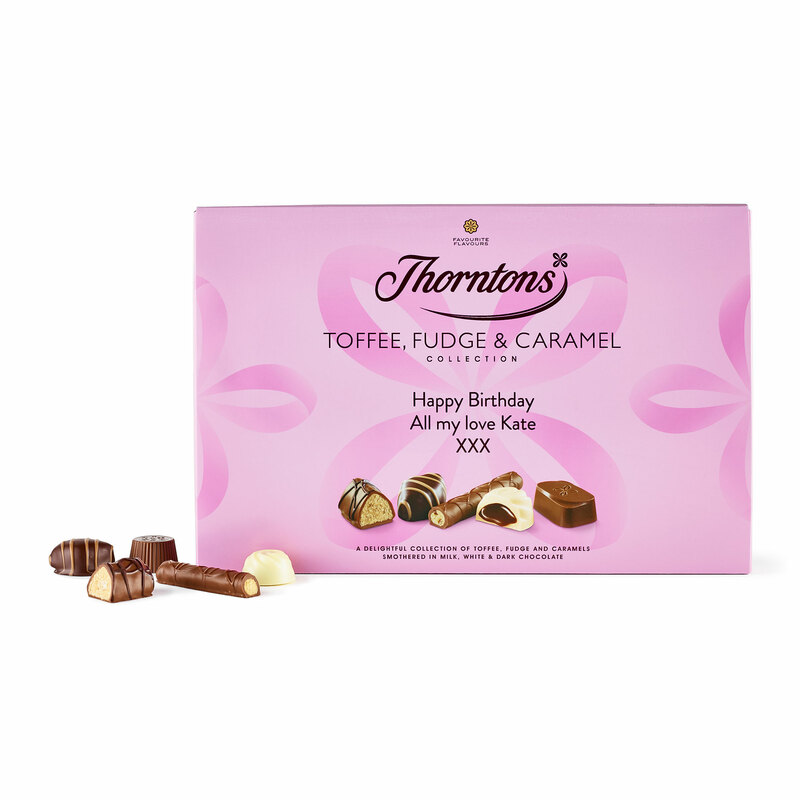 This personalised box of Toffee, Fudge and Caramel chocolates is for those people who want one of their Thorntons favourites every single time. This is a box full of sweet, dreamy, creamy, crunchy richness that is hard to resist. As well as flavours such as the Gooey Caramel that spills extravagantly into your mouth with the first bite and the velvety smoothness of the Creamy Fudge, there are some special additions including soft and creamy - but slightly crunchy - Granola Fudge and the elegant Nutty Caramel, a heavenly combination of smooth praline and gooey caramel encased in a silky white chocolate swirl. Sugar, dried whole MILK, cocoa butter, cocoa mass, glucose syrup, sweetened condensed milk (whole MILK, sugar), butter (MILK), dextrose, palm oil, HAZELNUTS,whole MILK, coconut oil, OATFLAKES, MILK fat, humectant (sorbitol), invert sugar syrup, single cream (MILK), emulsifiers (SOYA lecithin, E471, sunflower lecithin), flavourings, salt, fat reduced cocoa powder, honey, dried skimmed MILK, dried EGG white, margarine (palm oil, rapeseed oil, water, flavouring, vitamin A, vitamin D), MILK protein, raising agent (sodium bicarbonate).